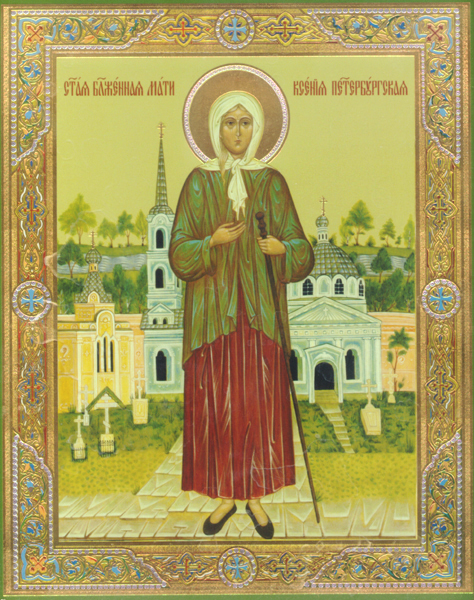 Blessed St. Xenia was a "fool-for-Christ," who, for 45 years, wandered around the streets of St. Petersburg, Russia. For the first 26 years of her life, Xenia had lived quite comfortably. However, after her husband suddenly died, the Holy Spirit led her to give away all her possessions to the poor. She put on her dead husband’s clothes and called herself by his name, saying that Xenia had died. Homeless, she lived in the streets all year round for 45 years, owning only the ragged clothes on her back. The Holy Spirit also led her to give away her mind and her heart to God. By giving everything away, she became rich in humility, simplicity, self-denial, kindness, and deep and profound love for all. By pretending to be insane, she showed how insane the world and its values are. By denying herself the comforts of a home, a bed, decent clothes, food, and the appearance of being "normal," she helps us to examine what really is important in life, and what really is "normal." By her self-denial, Blessed St. Xenia daily died to her old self and daily lived only for God. She trusted totally that God would provide for her, as He provides for the birds. During the day she wandered the streets, dressed in rags, enduring heat and cold, snow and rain, mocked by people. At night she went out into the fields and prayed all night, and at other times she spent the night at the Smolensk Cemetery. It was at this cemetery that she helped the workmen build the Church of the Smolensk Icon of the Mother of God (photo to the left), by secretly carrying bricks up the scaffold during the night. One night the workmen hid to find out who was helping them, and discovered that it was "crazy Xenia." As the years passed, the Holy Spirit filled Xenia with greater riches, and she became increasingly blessed. 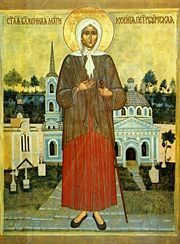 After a while, some people started to notice that "crazy Xenia" wasn’t so crazy after all, but was an instrument of divine grace, to whom had been given deep spiritual powers: she could see into people’s hearts and into the past and future, and appeared to people in visions. Anyone whom she touched was blessed. Because she gave up living for herself, she was able to live for others, helping those in need. She especially helped families, children and marriages, as she continues to do today. After she fell asleep in the Lord, around 1803, she continued to help those who asked for her assistance. Throughout the 19th century, tens of thousands of people came every year to her grave, and countless miracles occurred. 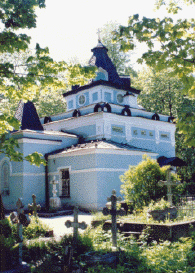 In 1902 a chapel was built over her grave in the Smolensk Cemetery, located on the western end of Vasiliev Island in St. Petersburg. This chapel has now been reconstructed (photo to the left), again welcoming the pilgrims who come there every day, and the miracles continue to occur. For 200 years people have been turning to the Blessed One, and she has been helping them. Her great spiritual power and her deep love for people transcend the grave and are manifested daily. One of the most popular of God’s "chosen ones," her canonization in 1988 was official recognition of what the faithful had long witnessed and experienced. This is the icon of Blessed St. Xenia that is in the chapel over her tomb, painted/written at the time of her glorification as a saint in 1988. In the background is depicted the Smolensk Orthodox Cemetery in northwestern St. Petersburg, where she spent most of her nights, and where she is buried. 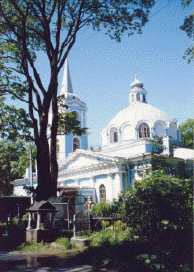 The blue church and bell tower immediately behind the Blessed One is the Church of the Smolensk Icon of the Mother of God, which she helped the workmen build, as mentioned above. To the left of the Blessed One is a representation of the chapel over her tomb (now painted blue). The photos are by the author.